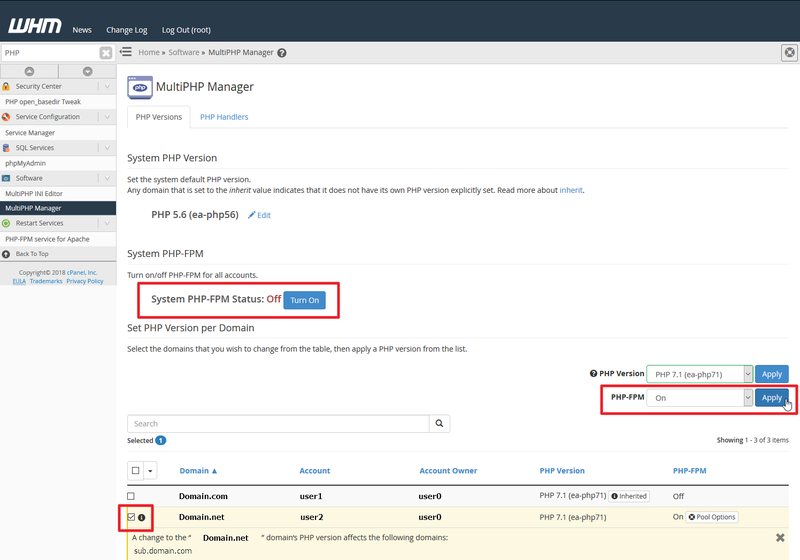 After enabling PHP-FPM (PHP-FastCGI Process Manager) on your VPS, you'll need to know how to restart the PHP-FPM service and modify its settings. Below we cover how to adjust PHP-FPM settings according to traffic load per cPanel account. From the menu, search and select MulitiPHPManager. 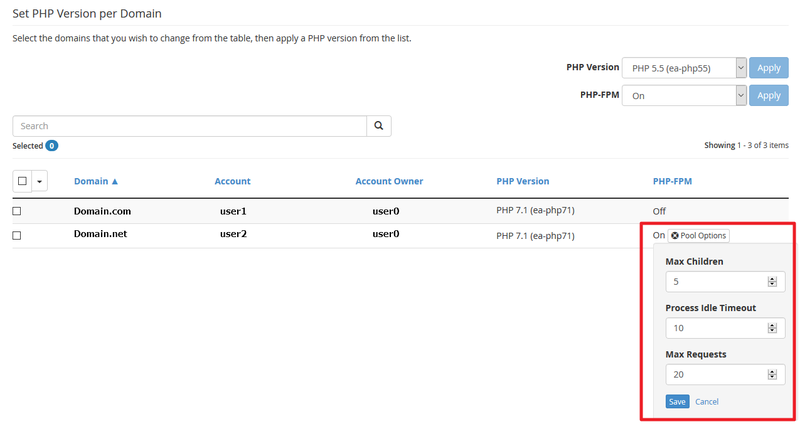 Select Turn on to enable PHP-FPM for all cPanel accounts. Alternatively, you can select the checkbox beside specific domains at the bottom, choose On from the dropdown menu beside PHP-FPM, and select Apply. You can also change the PHP version here instead of in cPanel. Select Pool Options beside the specified domain. Modify PHP-FPM settings for the domain. Below are commonly successful changes according to amount of traffic your VPS receives. If you have many cPanel accounts, you may prefer to change the default settings for newly created cPanel accounts. As root, SSH into your server or launch WHM terminal. pm_max_requests: Number of requests a child process executes before respawning. pm_process_idle_timeout: Time until an idle process is killed in s(econds), m(inutes), m(inutes), h(ours), or d(ays). php_value_disable_functions: Functions to disable. This doesn't overwrite php.ini settings. Save and exit the file. Using nano, press Control and x for the save prompt before exiting. Press y, then Enter ⤶ to save the file. Note:You can also restart PHP-FPM from WHM. These adjustments should help you make the most out of your VPS optimization. You can learn more configuration options for PHP-FPM with official cPanel documentation. You can read more about the benefits of PHP-FPM in our in-depth article.